Korea is well known for being a country where animation is outsourced from overseas. Did you know that Korea creates a lot of its own content which also relies on the work of foreigners? Meet Mina and Valerie. Mina (on the left) is from the United States. Valerie (on the right) hails from Canada. Both young women are English teachers in Korea, a common job for foreigners here. They are performers at heart and have found a way to put their skills to work. They are coached by their agent (on the left) who recruited them. 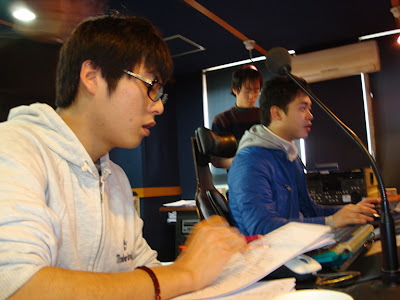 The recording is directed by former teen pop singer TJ (in the middle) and assisted by MJ (way in the back). Their job is no easy task. These young woman have to sing songs originally written in Korean that were translated into English. Reworking these Korean songs into natural sounding English versions required lots of tweaking. For instance, the songs made use of onomatopoeia devices found in the Korean language that simply do not exist in English. Gegul is the sound of rolling in Korean, but in English that sound doesn't exist. So they have to just sing rolling, rolling, rolling instead. They had to repeat songs over and over until they got it just right. Besides singing their hearts out, they also get to lend their voices to a cute baby boy (Mina) and a young sweet girl (Valerie). Boom Chiki Boom! is the preschool program they work on. It's a program full of dancing and exercize. 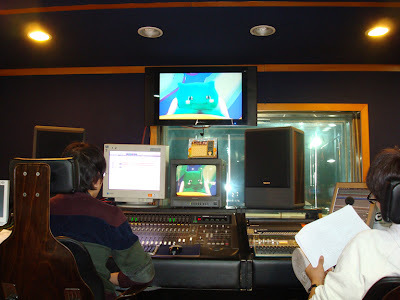 A unique feature of the show is that there is both a live-action puppet version and a 3D computer generated version. If you look closely on the monitor, you can see my favorite character from the puppet version. 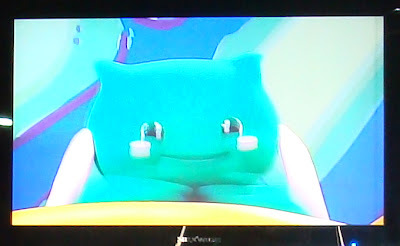 Here's a blurry close up of that mischievous green thing. 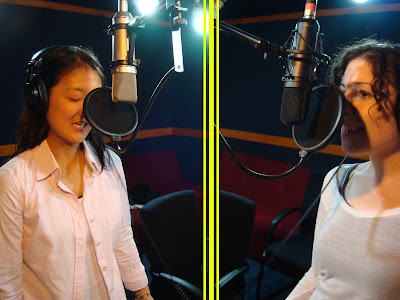 Through voice acting, Mina and Valerie are allowing Boom Chiki Boom! to possibly gain a wider audience than it would in Korean alone. And there are more such foreign voice actors as well. The world of animation and entertainment is full of work between people of many different nationalities. This day in the recording studio is just a very small slice of that. I used to be on MBC's Surprise and act and do voice-overs on all sorts of Korean TV shows, CF's and films. Midodok, I have an article on Korean animation and an interview I did with Kim Chong Gee back in 2006 going into a Western English language magazine in February 2008. I need some help with some translations of titles from old Korean animated films of the 1970's- can you help me? Go ahead and send me an email and I'll see if I can do anything (click on the image to find my email). How does someone get the attention of such a recruiter/agent? I've done a good deal of voice work, but this sort of thing seems like it'd be a great challenge and a lot of fun. Here in Korea, the foreign voice actors were recruited simply through loose contacts. So, it was sort a matter of luck. Ultimately, though, the actor's ability gets them the job and keeps them getting future jobs. 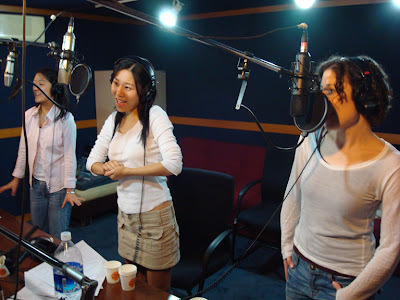 Would you happen to know how Mina and Valerie were able to obtain the appropriate visa to work both as English-language teachers and voice actors in Korea? I'm going to Korea myself in a few months for an English-language teaching position and was also planning to do work in media/entertainment there, but the work visas available appear to restrict incoming foreigners to working only one job or job type. Any info into this would help greatly! Hey there, Its very amazing site. I am glad to visit here and got awesome information recording voice over. You have great knowledge about it. Thanks for your sharing to us..
Hello, I am an aspiring voice artist who is still studying in India. Is it possible for me to be a voice artist in Korea too? Hello Midodok, I am fresh College graduate from the Philippines, is there a chance for me to have a chance in working in Korea as a voice actor..? Really hard work is needed to become a successful korean voice over . Salute to those who managed to get through the tough task. It looks easy to just sing or just reading the dialogue but to bring out the emotion takes a lot of practice. I always dream about becoming one. Hopefully it will come thru someday.